Rachelle Cannon (not related to Shelly Cannon) is known as the Queen of Quads. Based on the photos below, I believe you’ll find ample evidence of why the nickname has stuck. Rachelle developed those legs in part due to her mastery of Track & Field. She was also involved in competitive swimming, and many forms of dancing (tap, jazz, ballet, modern). 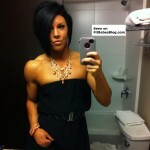 Julie Ann Kulla is a 28 year old fitness competitor from Minneapolis Minnesota. She stands 5’2″ tall and weighs about 112 lbs when she competes. She’s been competing for about 4 years, and it shows in her arm and deltoid development. She is a personal trainer and spokesperson for Species Nutrition. Julie Ann placed 2nd in Pro debut at the 2008 IFBB New York Figure competition, which qualified her for that year’s Ms. Figure Olympia. She placed 12th in that contest. She says her favorite cheat food is chocolate, which means she’s human instead of bionic, and may have to diet a little extra if her cravings get out of control! Ok, part 2 of our misc muscular babes series. Same rule applies – if you know who any of these ladies are give me a shout! Now we will take a break from our regularly scheduled program and check out some photos of various muscular babes. I have not been able to identify any of these ladies, so if anybody can help me out with some names, info, links etc that would be great! Jody Wald is about one zillion pounds of muscle stuffed into a very compact package. Jody was raised in Canada, and has a degree in accounting and an MBA. She is obviously more of a true bodybuilder. She started consistently lifting back in 2002, and has been winning contests every since. In 2008, she place 1st in the North American Bodybuilding Championships in the light heavyweight category. Gina Carano, known as Crush on American Gladiators, is MMA’s most famous female fighter. She stands 5’8″ tall and weighs a hefty 143 lbs. Born in Texas to a father who was a player for the NFL, she played basketball, volleyball, and softball. Gina graduated from college with a degree in psychology. Although she was defeated by Cristiane Santos, Gina remains the most talked about fighter in the game… possibly because she is smoking hot. After a number of requests, we wanted to take another look at Allison Moyer. Ali is still training like a madwoman. Her knees have been hurting her lately, which is may be from abuse and overuse. She is dating someone, and seems to really be enjoying her life. She celebrated her 25th birthday April 22 by buying Lacuna Coil’s newest album and rocking out. Laly Saxenian is an NPC Figure Competitor who is from Bellaire Texas. She is 33 years old. She placed 5th in the 2008 NPC Texas State Bodybuilding Figure and Fitness Contest. Laly is pretty muscular for a figure gal. Not that there is anything at all wrong with that! She claims her favorite show is Desperate Housewives, she likes shopping, and (surprisingly) driving. Elena Seiple is a decorated female bodybuilder who has won top placing in several NPC shows. She started out as a swimmer and became more athletic as she matured. She went through three knee surgeries as a college soccer player. She always looked up to people like Cory Everson when she first started lifting weights. Elena was born in 1973 in New Jersey.